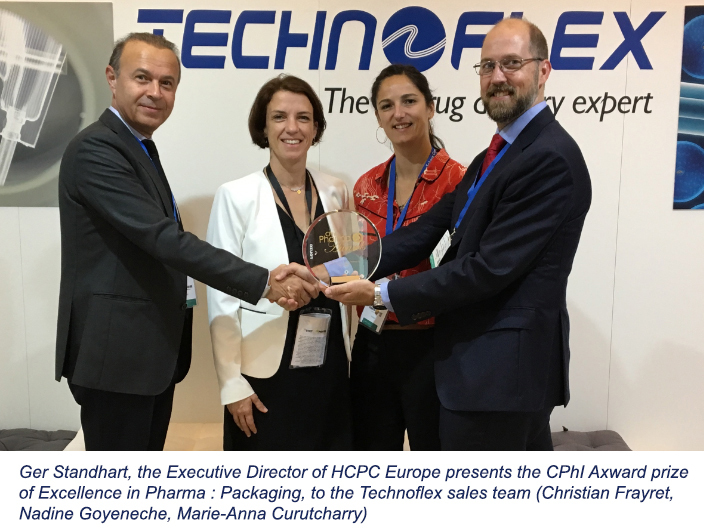 Technoflex is proud to announce that our Dual-Mix® innovation received the prestigious “Excellence in Pharma” award in the Packaging category. It was chosen from more than 250 candidates in 17 categories. Dual-Mix®¹ is a patented and innovative packaging for molecules that are unstable in a solution. This single primary package contains two compartments that hold a powder/lyophilized drug and its diluent. With Dual-Mix®, the drug no longer needs to be prepared in the hospital pharmacy. Safe and quick reconstitution is important not just at a patient’s bedside, but also in specific situations such as emergency or conflict zones.